Kyle Dixon & Michael Stein - Stranger Things, Vol. 1 (A Netflix Original Series Soundtrack). CD. Bleep. Invada press up a deluxe coloured vinyl edition of the soundtrack for the widespread 80s pastiche sofa glue that is Stranger Things. Like everyone else in the world it seems, we too have dived into the much-hyped internet-only TV show and while it caused a ricocheting sense of deja vu for cultural references we can't quite pinpoint, but are deeply embedded in our collective conscience, what we took away from it most was how affecting the incidental music was. And moreover, how much it slotted perfectly into the lineage of brilliant synth soundtracks that we all must own on wax no matter what the cost. From Popul Vuh's haunting work with Werner Herzog to the frazzled electronics of John Carpenter and Vangelis' flawless soaring cityscapes. Stranger Things touched upon a wealth of historic incidental music with the skills and talent of musicians who knew exactly what they were doing. 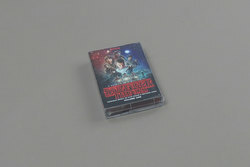 The thing that really strikes us about the music when taken out of the context of the film is how much Kyle Dixon and Michael Stein's audio touches base with records that upon glancing at the sleeve and noting the connections with Netflix, may not be considered in the same sentence, DJ set or record collection. When, in fact there are moments within the grooves of this first volume of the series that echo the ambience surrounding Eno and Fripp's Evening Star, Billy Green's cult classic biker-splotation Stone and Alejandro Jodorowsky's decadent psychedelic madness that is his Holy Mountain soundtrack. Much like the show, the soundtrack keeps a strong sense of individuality whilst bringing new things to the table even though it strongly glances back at highly regarded classics of the genre both the music and show follow in the footsteps of. For those prepared to lay their inhibitions aside and delve in, Stranger Things contains some of the most absorbing synth sounds of 2016, a record that could easily have come out on a label such as Blackest Ever Black to Trunk or even Planet Mu. Stranger Things is a totally absorbing listen and sure to be heralded as one of the very best ambient recordings of the decade for years to come.